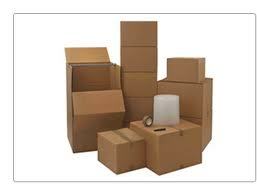 To protect your fine valuables, My Box Moving offers expert packing and crating services. Packing means placing loose items into boxes. Dishes, clothes, towels, linens, bathroom items etc. ... all need to be packed properly. Packing is a skilled activity. Dishes should be packed upright and wrapped in layers of tissue or newsprint. There should be packing material between them. The sides of the boxes should be layered with packing material such as newsprint also. The way packing is done can cause your fine items to break — or arrive intact. One way to save money on packing is to pack all of your clothes, towels and linens (things that are not so breakable) yourself and leave the fragile items to the packing crew such as dishes, china, and pictures. Packing does not mean wrapping your furniture in blankets! Some unscrupulous movingcompanies re-define the word packing to meananything they do with boxes, tape and blankets. Standard moving companies do not do this. Blanket wrapping is part of your move and is not a charged for service. Make sure you find out what the company means by "packing." Don't let "packing" get redefined! You may have heard horror stories of hundreds of dollars being added to moving costs because the moving company has "re-defined" the word "packing". Packing means placing items in boxes with packing material and securing the items in the box so that they are protected. Proper packing helps to ensure that your items arrive in perfect condition. This requires skill and is a valuable, charged-for service. Our movers are expert at packing and crating. You should also know that when you buy coverage on your move, the packing and crating that the mover does is covered and the mover can assume liability for the pieces. When packing and crating are done by someone other than the mover, the question of who is liable becomes unclear. Make sure to ask your mover about packing and crating. For packing and crating or just a simple move call us today at 718-439-1322 .We'll be happy to help, and to provide you with a free quote.